When the Griffin house loses power (yet again) the characters reluctantly perform another Star Wars parody: Family Guy: It’s A Trap! . The opening crawl warns you to “lower your expectations” explaining that they “ran out of gas” after the first two movies but Fox forced them to make another. It’s not just self-deprecating humor, it’s also a subtle dig at Star Wars Episode VI itself. The rest of the movie isn’t so subtle. No one is more critical than Peter. After he sees Leia’s braided hair, he points out the inconsistency of Ewoks that “use spears with wooden shafts and stone carved tips yet they clearly understand the finer points of cosmetology.” Leia concedes, “Yeah, I know. It’s not as good as Empire.” Eventually Peter has enough of the cutesy Ewoks entirely and decides to make things a little darker by forcing captured imperial soldiers to dig their own graves with their helmets. The deep voiced Patrick Warburton lends his voice to another character with no legs: Jabba the Hutt. If you listen closely you’ll hear him sneak in some English like singing the song “Lady Marmalade” and saying “Mila Kunis” who is the voice of Meg and makes her first appearance in the trilogy as the Sarlacc pit (naturally). Other new appearances include Cleveland Show characters Rallo (Nien Nunb) & Tim the Bear (Wicket the Ewok) and American Dad characters Klaus (Admiral Ackbar) & Roger (Imperial Officer). It was disappointing that Roger with his love of dressing up only played one role, and a small one at that. Despite his whiny voice Roger would have made a great Jaba, saying things like ‘Does this slave girl make me look fat?’ before dropping them into the Rancor pit. The best scene, other than Leia’s slave girl outfit of course, is the speeder bike chase which goes low tech with actual bicycles. But that doesn’t make the it any less deadly. 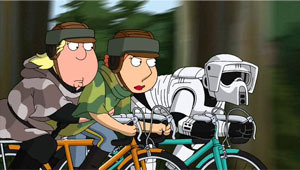 Taking (read: stealing) a page from Aqua Teen Hunger Force not only do the bikes inexplicably explode on impact so do the stormtroopers. The chase matches the original virtually frame for frame. It even has music by Star Wars conductor John Williams, who trails them with an orchestra also on bikes. Not even low expectations can prepare you for “Pie Fighters” that shoot actual pies. They even sink as low as reusing a joke from Robot Chicken: Star Wars Episode III where the Emperor falls onto the windshield on the Millennium Falcon, which wasn’t that funny to begin with. But unlike Robot Chicken, Family Guy doesn’t embellish Boba Fett as you might expect since he’s played by Peter’s own nemesis, Ernie the Giant Chicken. Instead, Boba Fett is dispatched off screen while Han and Chewie exchange an endless series of head nods to confirm their next move. When Han inquires what happened, an alien nonchalantly tells him that Boba Fett fell in the pit. The Emperor is unable to anger Luke to turn to the dark side so he resorts to attacking Seth Green the actor who plays him, a running gag in the series. Not only does he resist but when the story ends and the lights come back on in the Griffin house, Green goes on the offensive and attacks Family Guy creator Seth MacFarlane. Not surprisingly the characters voiced by MacFarlane (Peter, Brian, Stewie) side with him, but the rest let him have it. They call him a sell out, criticizing how few episodes he puts out each season and yet still divides them up into multiple DVDs. Peter defends Macfarlane by telling Chris that he hopes people will just remember the laughter, which is followed by awkward silence and the credits. It may not be the funniest in the series but just like Return of the Jedi, you can’t watch 2/3 of a trilogy.